Choice still has a positive effect for students’ motivation and engagement. 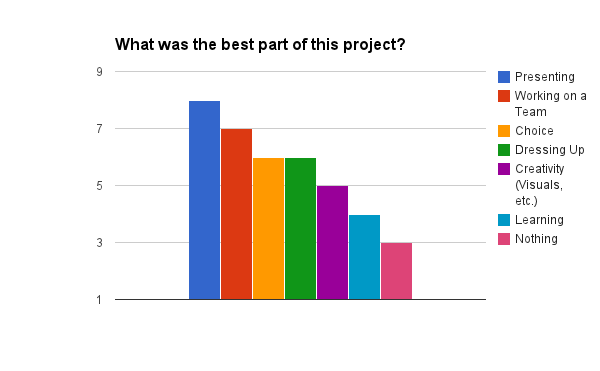 Although choice looked different in this project than it did in the Thermochemistry Project (topics were more limited but content was more open) choice in general was beneficial. Motivation and engagement was still high as my students enthusiastically researched their molecules. Students still cited choice of their topic as one of the top three best parts of the project. An overwhelming majority of students responded that they found a molecule that interested them which in turn increases engagement. Beyond the obvious benefits of choosing a topic of interest that were explored in phase 1, I also noticed that choice of what content to include had an impact on my students’ perceptions of the assignment. In their journals, many students mentioned that they enjoyed researching and learning about their molecules. My observations showed that, contrary to the image searches that made up the majority of research in the Thermochemistry Project, my students were actively engaged in content research as they sifted through the bevy of information on their molecule to piece together an argument. Putting the onus on the student to choose the content to include in their demonstration of knowledge increased their engagement with their topic. There were several pieces of data that pointed to the importance of public demonstrations of knowledge. First, there was a huge increase in engagement with the Organic Molecule Project over the Thermochemistry Project and other assignments in the class. My students were more focused on the project than I had seen previously and spent more time on the project. The turn in rate was almost 100% and when asked students cited the fact that they “actually had to present” as a key factor in why they worked so hard on the project. Beyond the role that presenting played in their grade, students ranked presenting as the number one best part of the project. My students really enjoyed interacting with their peers through the presentations and sharing their knowledge. I think one of my students summed up the role of presenting on motivation perfectly: “The best part was presenting this to other people to help them learn because by knowing that, I feel responsible for their learning.” In their feedback forms my students also mentioned repeatedly that they learned a lot form the Organic Molecule Project. These two points echo Deci’s research on motivation which states that students retain more conceptual information if they know they will be teaching it to others versus taking an exam. My students preferred “real science” over fun projects. I created the Thermochemistry Project both as a medium for choice as well as a response to students feelings that science was not relevant to their lives. Because the only conditions for topic choice in that project was the presence of heat flow, the choices were endless and I hypothesized that each student could find a fun topic that interested them. When I created the Organic Molecule Project I worried that the project was considerably bounded in terms of topic and my students would not find it as engaging. 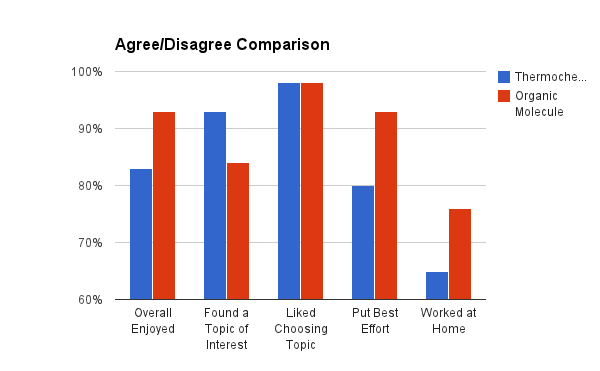 Based on feedback forms, yes, students found topics of interest at a higher rate in the Thermochemistry Project. However, engagement, motivation, and overall enjoyment was higher for the Organic Molecule Project. My students felt liked they learned more. They enjoyed becoming the expert in a particular molecule. They felt more like scientists, using academic language and engaging in academic discourse with their peers. They felt like the experience of a scientific conference was beneficial. The act of participating in “real science” benefited my students not only in their engagement and motivation in this project but also in increasing their perceptions of themselves as scientists.